The Windy Nation 100 Watt Complete Solar Charging Kit allows you to start producing free, clean power from the sun! Perfect for RV’s, boats, cabins and back-up power! 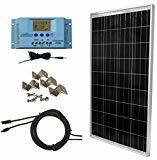 WindyNation’s 100 Watt Solar Kit includes what you need to get started: (1pc) 100 Watt Solar Panel, User Adjustable LCD 30-Amp Solar Charge Controller with Battery Temperature Sensor, 40 ft of UL Listed 12 AWG Solar Cable, all necessary MC4 Connectors for wiring, and all the necessary mounting hardware (4 Solar Panel Mounting Brackets and Fastener Sets). Product photos above show individual pictures of all the included items and additional technical information. Add a 12 volt battery and a DC-to-AC inverter and you are ready to harness the sun’s free energy. The WindyNation 100 Watt Solar Charging Kit is the ideal solution for providing back-up power or off-grid power when you need it! This Kit includes our premium grade PWM solar charge controller with digital display. The digital display provides detailed system information including solar panel charging amperage, battery voltage, battery temperature, amperage of load draw (if a load is connected), solar generated amp-hours to battery, etc. See Image in Photo Gallery above for an image of all LCD readouts. System settings like voltage of solar disconnect, voltage of load disconnect, etc are user adjustable using the MODE and UP and DOWN buttons on the charge controller.